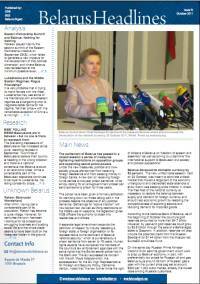 The fourth issue of Belarus Headlines features a review of the most important developments in the political, social, and economic life of the country as well as a number of articles. The article on the EaP summit analyses a proposal articulated by Polish Prime Minister Donald Tusk to provide financial assistance of nine billion dollars to Belarus if the country meets EU conditions. It also pays attention to the efficacy of Belarus’ diplomacy in dealing with EaP countries to prevent them from aligning with the EU position on Belarus. The article on Belarus’ friendships in the Middle East takes a closer look at Belarus’ cooperation with Iran and the Arab states and tries to determine if these friendships are profitable for Belarus or if they are a ploy to be used in negotiating better terms for the regime in its talks with the West. In addition, we offer a review of the criminal trial concerning a terrorist attack in Minsk in April this year. The Research section of the bulletin provides an analysis of the latest public opinion poll conducted by the Independent Institute for Social and Political Studies (IISEPS) which recorded the lowest rate of support of the incumbent president ever. It also provides a summary of the analysis of reasons behind the attractiveness of the Russian labour market for Belarusians as well as the strategy by the government to attract low-skilled migrants to the Belarusian agricultural sector. In the “Unknown Belarus” section we offer you a trip to the Belarusian wonderland of Rakaw, once a prosperous town famous for its crafts, trade, smuggling business and bustling social life, which has now turned into a quiet village. However, the place still has a lot to offer a curious traveller or treasure hunter.